Karni Mata Temple is a popular and unusual holy shrine of India. This Temple is in a small town of Deshnok, which is located at a distance of 30 kms in south of Bikaner in Rajasthan. 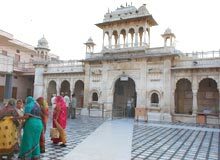 Karni Mata Mandir is easily accessible by regular buses from Bikaner and Jodhpur. To ensure a comfortable journey, one can also opt for taxis that can be availed from anywhere in Rajasthan. The temple is dedicated to Goddess Karni, who is regarded as the incarnation of Maa Durga.